A day just like any other, one of my friends visited me at my home. I was resisting a strong craving for tea for quite a time now and watching my friend making his way into the lawn, I felt snug and warm to have him in my company. As we started discussing different things of the political, social and religious ilk, he broke this news to me that some people are looking for a piece of land in order to set up a Dar-ul-Uloom there. Students and their parents at a special function in Kupwara seminary. I was totally appalled at this disclosure for there already exists a good number of such institutes in our locality, and to add up to this already profound list didn’t fall in line with my comprehension. Would it really augment the endeavour for which institutes like this stand in the first place? I shared this concern with my friend too, so as to get his opinion in this regard. He was well-nigh blank in this case. 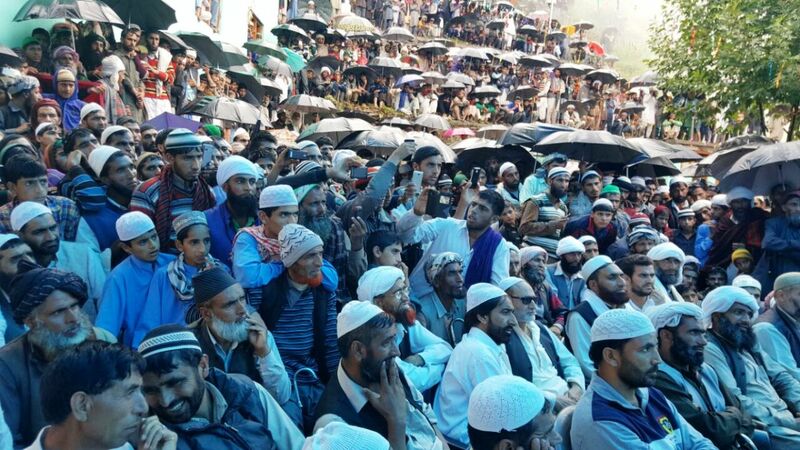 Never the less, he had imbued within me a curiosity to know something which hitherto was beyond my ken, the functioning of Dar-ul-Uloom’s in Kashmir. Entitling myself with the task of procuring some useful information regarding the role and functioning of different Dar-ul-Uloom’s in Kashmir, I shortlisted few of these and embarked on a journey that was to revamp my preconceived notions in totality. On July 6, 2018, with the arrival of dusk, I too arrived at a nearby Dar-ul-Uloom, famously called Faizan-ul-Quran which is located in the hamlet of Pandithpora. Making my way straightaway to the cabin of Mohtamim (manager), I introduced myself as a researcher whose area of interest encompasses the functioning of Dar-ul-Uloom’s too. I was greeted quite well by the attendants. The Mohtamim agreed to respond to my questionnaire which I had drafted quite succinctly. During the course of the discussion, he apprised me of the fact that the said institution was set up in January 2017 and had thirty-two students on its rolls. Out of these thirty-two students, fourteen were orphans. Furthermore, what I found surprising was that nine of the students belonged to Jammu region, even though the said region does have a number of such institutes operating there also. Few other students were from Tangdar area which is more than sixty kilometres at distance from our hamlet. Expenditure is the most vital factor of any organisation, I was keen to know how they manage it. To my surprise, I was told that the said institution garners all of its finance from public donations. Moreover, they had recently bought a piece of land for a hefty amount of around seventeen lakhs. The other unit I visited was Dar-ul-Islamia, Renan Qaziabad which was established in 1996. Everyone there seems to boast that all the Imams of our area were produced by this very unit which ironically was contested by a Mohtamim of a different unit in our locality. This too had thirty-two students enrolled who mostly were from Baramulla district. The third unit I visited was Dar-ul-Uloom Dawat-ul-Haq, Ganapora which was established in 2002 and has twenty-seven students enrolled at present. Its first Mohtamim, I came to know, had left due to some salary issues. 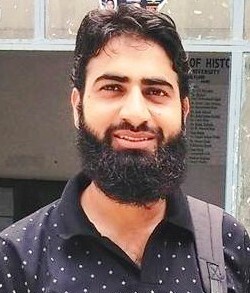 I spoke to a teacher there from Gurez when I asked him what had prompted him to quit his studies in the seventh standard and opt for Dar-ul-Uloom. Without mincing his words he replied that there is an honour only in learning and teaching Islam, period. I was quick to argue, “What about the doctors, engineers and academicians? Are they not honourable people”? His answer was nothing more than a smug smile. When I left the place, the sole deduction I could make of all this was that these units provide cannon fodder for the teachers who draw their income from public charity. Dar-ul-Uloom Faiz-ul-Kabir, Kralgund was the last one I visited. This is the Markazi Dar-ul-Uloom in the area which started its functioning from 2003. Its teacher is from Uri Baramulla. There I was dumbstruck to know that they aren’t authorised to teach a book on their own recommendation unless they consult Dar-ul-Uloom Deoband for that matter, which is a parental body of most of these Dar-ul-Uloom’s in Kashmir. Deoband follows the syllabus of Dars-e-Nizami, which was prepared by Mulla Nizami in the eighteenth century. There haven’t been any major changes in the syllabus since then which has exacerbated the situation further. After interacting and interviewing the heads and teachers of these Dar-ul-Uloom , I felt that some grave errors have gone unnoticed until now. First and foremost, these Dar-ul-Uloom’s collect zakat, usher and charity from the local population which more preferably should have been utilised among the deserved ones like widows, orphans and the downtrodden section of our society. The money they collect is disbursed in an inappropriate way because there is no formal audit system at work which leaves things non-transparent. More importantly, it further culminates in robbing the efficient Islamic concept of Baitul-Maal from its locus. Secondly, the academic qualification of the teachers in these units ranges from sixth to tenth standards. It is in the rarest of cases one would see an average graduate out there. The worst part being that these institutes are destitute of establishing a full-fledged library within their premises which itself speaks volumes about the obnoxious state of affairs which these institutes continue to rot in. The sad part being there is no scope of improvement even as the faculty running these institutions are themselves not equipped with any erudite scholarship. Given the paramount significance of a teacher’s profession and the inevitability of some intellectual property, these people deserve anything but teaching as their profession. Ironical enough, this points towards a much critical issue that being our insensitiveness towards the future of a huge chunk of our valuable asset, our youth. To entrust an ill-equipped coterie of orthodox and conventional people with a crucial responsibility of our future generation is something that can’t go unabated. Their intellectual level is such that expecting a critical outlook from them seems preposterous now. Our highly cherished legacy of Ijtihad which remained the cornerstone of our academic legacy for centuries has vanished from the scene permanently. On the social front, they face serious problems when they step out in the market of employment as they lack everything that is deemed quintessential to secure a good job. What is left to be done for them is collecting donations for these institutions which have been responsible for dragging them to this abysmal position. And this has left the masses wondering that whether the people running these institutes provide for these orphan and poor kids or is it the vice-versa? What I suggest, in the end, is that there should be a proper mechanism regulating the financial dealings of these institutions so that the general public must not suffer any iota of ambiguity while making their donations. Not only this, the number of Dar-ul-Uloom’s should be monitored so as to ensure the quality of education is preserved. I see a desperate need to take the necessary measures in order to improve the standard of these institutes; else we would see more and more ill-equipped and conventional clerics flooding the market, with no utility at all. we need healthy criticism and constructive reforms for darul ulooms to strengthen them further. As opposed to what modernists are trying to do. Your thoughts resonate with BJP and RSS.. You guys are on the same page… Just answer my simple question.. Had it not been for these institutes who would provide Islamic education in Kashmir?? Who would produce Haafize Quran in Kashmir?? Who would inculcate the education for producing Imam? Muftis? Scholars?? Will KU do it or IUST or SSM?? Its a shame you chose to write against them instead you should have written about the contributions these institutes are making in our society.. mainstream education has degraded so much that you can now study anything sitting on your toilet seat from your tab or mobile device but people spend 10-15 years in these institutes just to be eligible to become an imam or a mufti…they become eligible to answer your basic questions about religion.. to lead prayers to perform nikah.. True they make very less money but they have contentment unlike the one’s like us who have highest degrees and still crave for more money.. I hope this should be enough for you to realise the blunder you made by writing this piece.. I would have instead wanted to see you writing something about volunteering and teaching the kids in these institutes..it is true that these institutes don’t offer mainstream education.. they can’t afford it either but there are many friends of mine who volunteers and teach these kids.. they spend time with them and they also buy stationery for them out of their own pocket.. May Allah guide us all.. Very beautiful Response Sajid Sahib to this shameful and RSS stooge . What have Madrasas given to the Society and kashmir in General? 1.They are the forts of Islam and only deprived from the mercy of Allah like the Author of this Article will write against them. 2.They have given us thousands of Ulama ( Vicegerants of Nabikareem Salalahualiehiwasallam ). 3.They have given us Thousands of Hufaaz . 4.It is because of them ,we and our children can read Quran with Tajweed. 5.They are ones who have kept Moral values and Human Values intact in our society. 6.It is because of them ,we can go for Nikah. 7.They are the ones who we need at the times of our jinaazah. 8.They are the ones who guide us in day to day fiqh and masa’il. 9.They are the ones who are responsible for the tazkiya and reformation of our immoral youth and drug addicts and Alcohol addicts. 10 .Madaris are the fountains of Islamic knowledge and jurisprudence. 11.They are the ones who guide us to keep enivironment and surroundings clean. 12.Madaris are the spiritual centres where one learns zikr and fikr and love of Allah and Nabi Salalahualiehiwasallam and what not. I am M.Tech in computers and I have done my schooling from Tyndale Biscoe.If at all these madaris would not had been their and I was not connected to them,I could have been destroyed and I could had been morally corrupt product like the Author of this Article.It is the blessings and the barkat of these madaris that has helped thousands of people like me to safegaurd their faith and to have a very clear thought of Islam. I am really appauled and ashamed by your sheer illiteracy and how you are acting as a puppet of shaitan,yahood and RSS stooges.